Print: 9 x 7 x.5 inches, With Display Base: 9.5 x 7.75 x 2 inches. 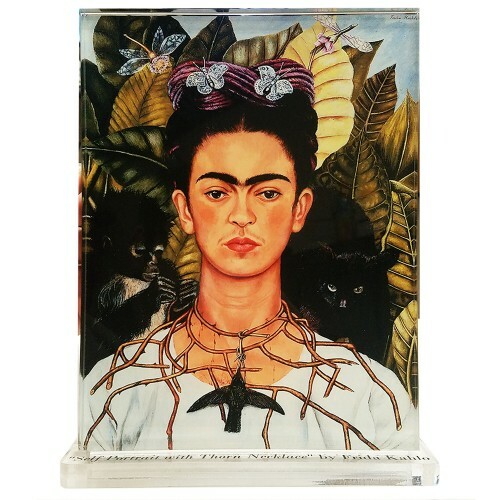 Our clear acrylic display of Frida Kahlo -- Self Portrait with Thorn Necklace. All acrylic displays come in two pieces: a printed base with the artists name and title of their famous painting, and printed artwork on half inch clear acrylic. Items are printed and produced to order. Printing and processing takes up to 5 business days plus shipping time to your location. Masters Behind the Glass are NOT printed on glass but gives the illusion of glass.Self-Portrait with Thorn Necklace and Hummingbird (Autorretrato con Collar de Espinas) is a 1940 painting by Mexican painter Frida Kahlo. Kahlo painted the self-portrait after her divorce from Diego Rivera and the end of her affair with photographer Nickolas Muray. Muray bought the portrait shortly after it was painted, and it is currently part of the Nickolas Muray collection at the Harry Ransom Center at the University of Texas at Austin.